Owing to our expertise in this domain, we are engaged in offering an extensive range of Ratchet Lever Hoist . 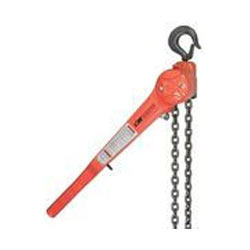 The offered chain hoist is used for lifting heavy load to carry from one place to another. This chain hoist is manufactured from high quality raw material under the supervision of skilled professionals as per the international quality standards at vendors’ end. Clients can avail this chain hoist from us in different load carrying capacities at industry leading price. Established in the year 2011, at Vadodara, (Gujarat, India), we “Kr Sales” are the distinguished trader and supplier of a wide array of Hand Tools, Test And Measurement Instrument, Micrometer Instruments, Lifting Tools, Hydraulic Tools, Metal Micrometers, Digital Micrometers, Hoisting Equipments And Hydraulic Bolt Tensioners, etc. Our team of dedicated and competent procuring agents procured the offered products from the reliable and quality-oriented vendors of the market in adherence with industry quality standards. The products provided by us are extensively acknowledged in the market for their remarkable features such as high functionality, long service life, hassle free performance, optimum strength, corrosion resistant body, maintenance free, etc. In order to furnish the vast necessities of our renowned customers, we provide these solar products in assorted technical specifications. Besides, clients can purchase these instruments from us at rock bottom prices.